Retail $31.09 SAVE 30% ! "One of the finest books ever written on modeling"
As a modeler from the 1960&apos;s era, and now getting back into it at retirement, wow have things changed. Models, and the equipment available to the hobbyist is better than ever. 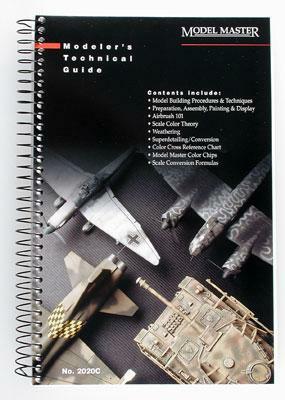 With this book you can see how far from the old days Testors has come, bringing their products into the 21st. century. The book gives you loads of hints and techniques to build better models. One aspect that is covered very well, is the use and selection of airbrushes. This is a whole new thing to me, and there are several exercise to help get the proper feel and technique to using them correctly. Then there are the paint charts, perfect for finding the name of the right paint for the model you are building. I found the book an excellent reference guide for the beginner, to the pro. Number of pages:155 SPECS: 6" W x 8-1/2" H Includes information on the following: The Experienced Modeler, Advanced Model Building, Finishing, Displaying, Understanding Paint, Airbrush Painting, Masking Techniques, Special Paint Effects, Weathering, Superdetailing and Figure Painting Illustrated with color photographs Includes color samples, color cross reference charts and measurements reference charts Index 5/21/98dh. Nice spiral-bound book with very useful information for the beginner, and I think even the intermediate modeler. It lists necessary modeling tools, explains the use of different glues, provides proper assembly techniques, even describing how to remove molding defects and other mistakes. Especially helpful were the techniques for transferring decals onto models, and the information on the different types of paints. In fact, it has quite a large number of sections on painting and finishing models and dioramas, including how to add those small, but realistic touches to your project such as rust, dust, battle damage and weathering. For me, the guidance on how to achieve realistic camouflage was most helpful and one of the primary reasons I purchased the book. It also goes in-depth into airbrushing techniques as well, something I plan on getting into soon. A nice glossary of modeling terms and a very large technical section on the various brands of paints with color charts rounds out a very good primer for modelers. This Book needs to be entitled TEQNIQUES IN AIR BRUSHING. a great deal of the book is color theory and air brushing. When ever the book goes into painting a model they are talking about air brushing. This book is a must have for air brush users. Gives you plenty of color charts as well as model master paint catalog of sorts. Even though I do not airbrush in reading the book I did get a couple of really good suggestions from it. I wouldn&apos;t recommend getting this if you are not into airbrushing.